The board is pleased to announce the appointment of Werner Behrens as Chief Executive Officer of MAS effective 1 May 2019. Paul Jackson has been appointed as a Member of the Board of Directors, effective 04 October 2018. Nedbank Corporate and Investment Banking (NCIB) today announced that is has made the first disbursement from an innovative R120 million Sustainable Affordable Housing finance facility that was put in place through the collaborative efforts of Nedbank’s Affordable Housing Development Finance division, and South Africa’s Green Fund. In line with the National Development Plan, investment in infrastructure remains a policy priority with public-sector infrastructure investment plans totalling R987.4 billion over the medium term. 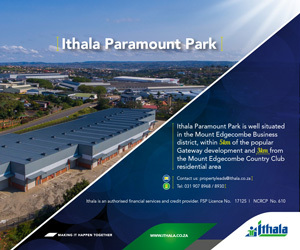 The revitalisation of state-owned industrial parks will promote industrialisation and increase their contribution to job creation and South Africa’s economic growth, says Trade and Industry Minister Rob Davies. Nedbank Corporate and Investment Banking (NCIB) and the Green Fund which is managed by the Development Bank of Southern Africa (DBSA) on behalf of the National Department of Environmental Affairs (DEA), concluded an agreement to jointly fund the development of approximately 400 affordable green housing units in the Western Cape and Gauteng Provinces. The Urban Investments Partnership Conference, co-hosted by the Departments of Cooperative Governance and the Department of Finance was held today at the Gallagher Convention Centre in Midrand, Johannesburg. Transnet, DBSA’s historic pact to fast-track private sector partners. The University of Venda (UNIVEN) will soon be able to accommodate more students, thanks to a R300-million loan agreement for the construction of student accommodation. Development Bank of Southern Africa‚ which ran a loss of R826m in 2012-13‚ has returned to profitability with a historic disbursement record.